U.S. Citizenship and Immigration Service (USCIS) is primarily a fee-funded agency within the Department of Homeland Security (DHS). Every two years they are required to review the fees they collect and adjust as needed. Earlier this month USCIS announced they have completed their “fee study” and have proposed raising fees across the board by an average of 21 percent. The fee hike that will have the largest impact on aspiring citizens is the increase in the already-high naturalization fee which is set to go up 6.6 percent. Currently the application fee is $680, including $85 for biometrics which will increase to $725. However, the agency will also implement a newly proposed partial fee waiver would reduce the naturalization fee to $405 ($320 plus a biometric fee of $85) for families living between 150-200 percent of the federal poverty level. For families of four, the new partial fee waiver would apply to those earning between $36,450-48,600. Individuals who earn up to 150 percent of the federal poverty level, will continue to be eligible for a full fee waiver. Of the 13.1 million legal permanent residents (LPRs) in the United States, 8.8 million are currently eligible for citizenship. Many, however, are not making the leap from legal permanent resident status to citizen. The number of those naturalizing has been less than 800,000 for the past five consecutive years (however there has been a recent spike in naturalizations which is likely due to the upcoming presidential election). For those eligible to apply, the application cost of naturalization is one of the main barriers to citizenship. According to Professor’s Manuel Pastor and Jared Sanchez from University of Southern California’s Center for the Study of Immigrant Integration (CSII) roughly 1 million people, or 12 percent of the eligible to naturalize population, could take advantage of the new fee waiver, cutting the cost of naturalization in half. Citizenship is a good thing for immigrants and for the United States. Citizenship means a commitment to the U.S., to the constitution, and to learning U.S. civics and history. Citizenship also comes with many social and economic benefits for individuals, families, children, communities, and our nation as a whole. Addressing the systemic barrier of the cost of naturalization, therefore, is important to prevent citizenship from becoming a privilege available only to those who can most afford it. 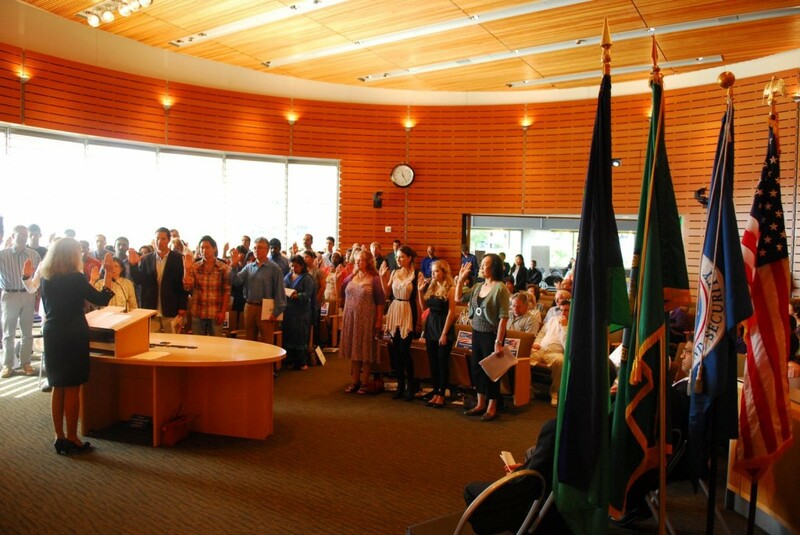 Photo Courtesy of City of Bellevue Washington.